The Intact Centre on Climate Adaptation (Intact Centre) is focused on four key areas that will reduce climate change and extreme weather risk for home owners, governments and businesses. Read more about our programs in our brochure. 1. The Home Flood Protection Program helps homeowners reduce the risk of basement flooding and minimize damage if flooding occurs. The Program features an on-site flood risk evaluation service, known as the Home Flood Protection Assessment. In roughly one hour, a trained assessor works with the homeowner to complete a 50-point visual assessment of potential sources of water entry into the home. A concise, easy to read report identifies top ranked actions to reduce flood-risk. 2. The Home Flood Risk Assessment Training Course empowers students to help homeowners identify sources of basement flooding, and identify opportunities to reduce those risks through what are often simple and cost effective solutions. Students also receive flood-risk assessment software that will enable them to produce customized home flood assessment reports. 3. 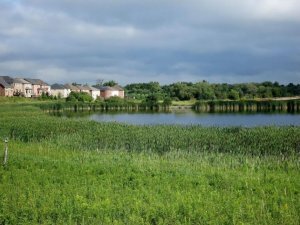 The Infrastructure Adaptation Program helps communities across Canada reduce the risk of flooding through development of national standard(s) for new and existing flood-resilient residential communities and establishing the business case for natural infrastructure (e.g. wetlands) preservation. 4. The Corporate-Specific Adaptation Program (CSAP) focuses on engaging business sectors (e.g., commercial real estate, electricity, telecommunications, etc.) to identify climate change and extreme weather risks, and to subsequently establish practical and cost-effective means to limit those risks.